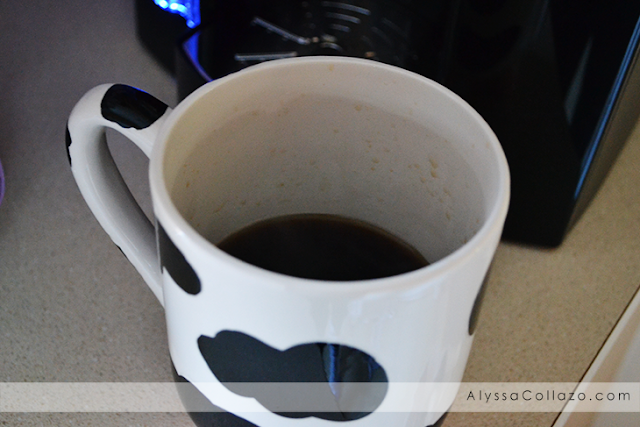 Having a great cup of coffee is a must and using my Keurig I thought I was doing just that, until I was introduced to the Remington iCoffee Opus with SpinBrew Technology. At first I was very hesitant about venturing off and trying a new single serve brewer, considering I have been very loyal to my Keurig. But with replacing my Keurig every few months and being limited to pods I decided to give it the iCoffee Opus a try. The first thing I wanted to learn more about was their SpinBrew Technology. Unlike other Single Serve Coffee Brewers the water is pushed through their SpinBrew needle that sends the water out the side of the needle and not out the bottom. Having the water come out the side of the needle means the water is spinning and steaming through all your coffee grounds inside each single serve cup, fully saturating the coffee grounds that in turn gives you a smooth tasting cup of coffee with no bitter after taste. And let's just say its HEAVEN. What I love most about the iCoffee Opus is the look. It's almost futuristic. It has spin dials, blue lights, and with the push of a button self opening for the coffee cup. The iCoffee Opus has a dial-a-brew option for choosing your preferred size of coffee cup. You can choose between 4 ounces all the way up to 12 ounces in .5 ounce increments. You can also expect, Hotter than hot, Smoother than smooth and Faster than fast Coffee because with the iCoffee Opus your coffee brews in less than a minute! The best part? The iCoffee machines accommodate any brand of single serve coffee pods/k cups, so you're not limited to any specific brands. A few other options the Remington iCoffee Opus has is a large 75 ounce tank, Energy saver mode, Automatic shut off, Removable drip tray to fit larger travel mugs, and comes with a reusable iCup to use your own coffee grounds. It also comes with a Bonus Starter pack. I can honestly say that the iCoffee Opus is now sitting in the place where my Keurig was. I HAVE found a new coffee brand that I'm in love with. This Single Serve Coffee Brewer will for sure be the ultimate Holiday gift for anyone and everyone in your life. But WAIT... That's not all! One of my lucky readers will win an iCoffee Opus RV $140! How awesome is that?! Be sure to ENTER the giveaway below. Ends 11/30. DISCLAIMER: All products received are complimentary for testing purposes from iCoffee. All opinions stated are my own and are not influenced by any affiliates. There are actually 2 features that I can't choose between and those would be that it accepts all coffee pods and K cups AND that coffee brews in 1 minute! 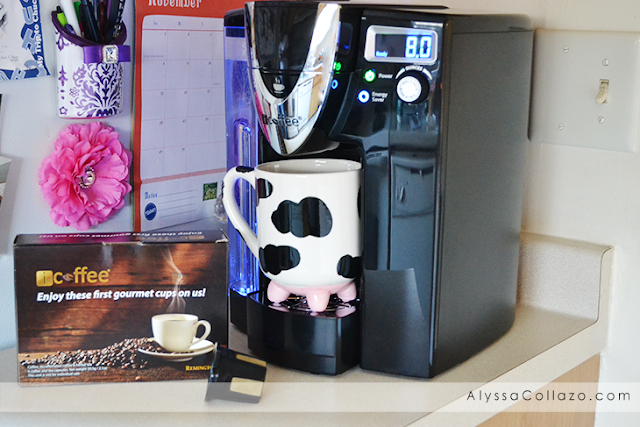 This looks so much nicer than the keurig too! I went to the website, I watched the way the new brewing technology is, amazing. I am sure the coffee is true to taste especially flavored coffee. I'm not a coffee drinker but my husband loves it. I will tell him about this coffee maker. It's great to know that they accept all pods - so many of them don't these days - and that it's quick and easy. That's my 3 requirements. When our Keurig dies, I'll certainly look into this one. This sounds absolutely awesome. My favorite feature is the 75oz tank. I make a lot of coffee so that's great to not keep refilling. We actually need a new single serve coffee maker. This sounds like a great model. I will look into the icoffee opus for sure! I haven't heard of this! Looks like it works really well, I love how it accepts all pods. I like that you can select so many ranges for a cup size. It's nice to be able to select more than three cup sizes. Thanks for the chance. I love the fact that it can use any pod!!!! This looks so cool!!! Ive heard of this just recently and I'm hoping to see it in real life soon! this looks seriously amazing!!!!! I love the fact that it can use ANY kcup brand. ps. your cow cup is absolutely freakin adorable!!! I am not big on coffee and usually don't focus much on coffee makers but I am loving your mug can I have please. 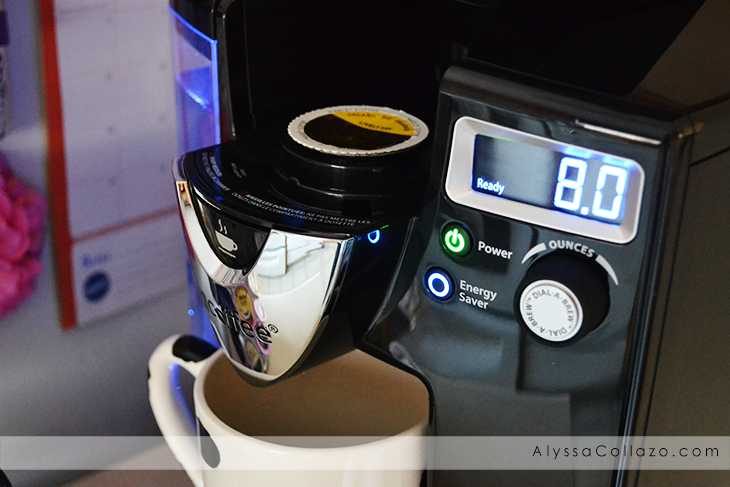 I like the large tank and you can use k-cups! I think my favorite feature is that it is large enough to fit travel mugs! My coffee maker won't make enough to fill one! It sounds great! I have a Keurig, but I rarely buy k-cups because they aren't recyclable...which makes me very sad because I'd like to reduce my carbon footprint just a little. Are these pods recyclable and are the pods easy to find in stores? I really want to go with something else. What a nice coffee maker. I love the new design of it. My hubby needs a new one soon. I'll be sure to check this one out. This looks awesome! I'm not a coffee drinker but my husband is an addict! I love that it has a dial-a-brew option for choosing your preferred size of coffee. I love your mug! Totally cracked me up when I figured out what it was! Looks like a nice coffee machine! I've never owned a single serve coffee maker, but it looks like this might be the way to go! I like that you can choose the size of cup you're planning to use! I like that I can make a cup of coffee in half ounces as well. I like that it has the energy saver mode! But really all the features look awesome. I love the look of this one. Really fancy! 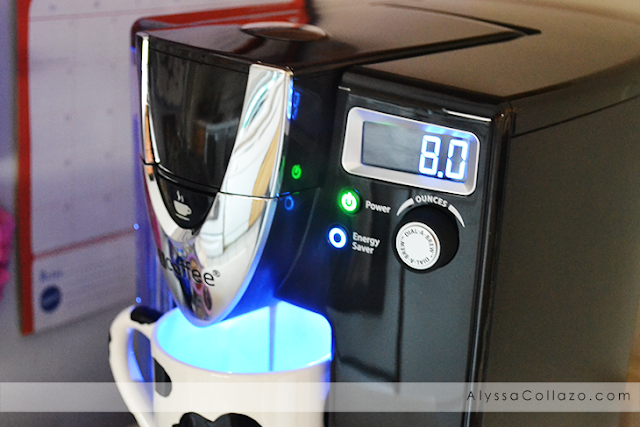 I LOVE that you're not limited to any one brand of K-cups/Pods and I love the blue lighting, Nifty!! It is awesome that it brews in under a minute! I like the energy saver mode. I really like that it has a 75 oz. tank. This makes fillups fewer. I love that it accommodates any kind of single serve pods. We love making a single serving of our favorite coffee instead of having to agree on one flavor. It is so cool that it accepts all pods. I love the look of this machine too. I'm an extreme coffee drinker, and when you research the brewing technology it's really exciting. Having a great cup of coffee is a wonderful thing, but you kind of settle for your normal everyday stuff from normal machines. The tech used in this seems very much different. I'm dying to try it! My favorite feature is the Energy Saver mode and automatic shut-off. I like that the iCoffee machines accommodate any brand of single serve coffee pods/k cups. I like that I would be able to fill my travel mug. My mug is bigger than most cups and I have trouble being able to fit it into most coffee machines. I am most excited that you can use Kcups or use regular coffee. I like the automatic shut off! I like that you can pick your preferred cup size. I like that I can use a variety of pods in it and that it will save energy as well.